Number 31 of the Doctor Aquilino Hurlé street (GPS: N 43º 32' 19.56'',W 5º 38' 52.95''), very close to San Lorenzo beach, it is only five minutes away on foot to the football stadium, the congress and business exhibition centre, the bull ring or the horse jumping centre. For both leisure and business it is a reference. Click on the image below to enlarge the Hotel area or consult a city map of Gijón pdf. Getting to the hotel is pretty easy coming from anywhere. Keep in mind San Lorenzo beach. The beach has ordered access stairs. The street of the hotel is in front of the 14th stair. - Coming from the Asturias centre (Oviedo) or West (Aviles airport or Galicia). Near Gijón, take Gijón surround E70 A8 and follow it until the 387 exit (el Llano-Pola de Siero)...pay attention... continue along AS248 to Gijón. At about 500m. 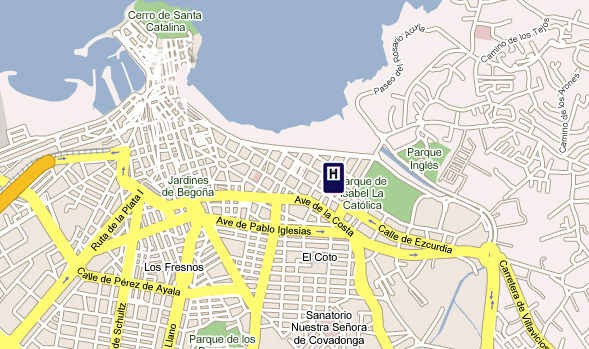 you will drive to Ramón y Cajal street wich will let you in the Menéndez Pelayo street and San Lorenzo beach.Turn to the rigth, we are at the third to the right again, number 31 of the Dr. Aquilino Hurlé street. - Coming from the East (Santander-Pais Vasco). Follow the above instrucctions but take the exit 386. - Coming from the South (León-Madrid AP-66). Getting to Mieres you should take AS1 motorway to Gijón until the very last exit. 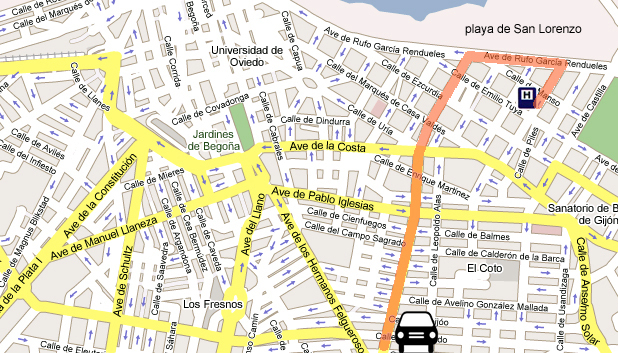 Follow AS248 to Gijón, don't leave it and at about 2,5 km you'll get to San Lorenzo beach. Turn to the right, we are at the third to the right again, Dr. Aquilino Hurlé nº31. From the bus and railway station there is a taxi service. This is the faster and most directly option to get to the hotel. It is also quite cheap. - Coming by car from the bus and railway station. Take the street Palacio Valdés to the Costa Road Avenue, turn to left at this avenue and continue along it until 300m. Turn now to the right to go into the street Domingo García de la Fuente and just 50m away turn to left again to go into Manuel Llaneza Avenue. This avenue will drive you directly into Pablo Iglesias avenue, continue along it all and turn to the left to get Castilla Avenue and to the left again at the fourth, Manso street. Continue until the second to the left, take that to get into Dr. Aquilino Hurlé street. We are at the 31. - Bus. Alsa has a bus service from the airport to the Gijón's down town, with hourly departures. The drive is about 40 minutes y cost about 10€. - Taxi. It's the fastest option. The drive is about 25 minutes and cost between 30€ and 35€. - Car. If you've rented a car at the airport, take N643 road to Aviles, then go for A8 motorway to Gijón until 387 exit (el Llano-Pola de Siero). Once there, follow the instructions in the section by car.